Measuring 5 x 6 x 0.002 in., polyester sign informs onlookers of hazards created by rotating wheels on bench grinders. It also informs operators and employers of proper work-rest and tongue adjustments for compliance with OSHA 29 CFR 1910.215, ANSI B11.9, and ANSI B7.1. Fully compliant with ANSI Z535 standards, product is held in place with 3M acrylic adhesive, which is resistant to chemicals and retains holding strength in temperature to 350Â°F. Informs of Hazards Created by Rotating Wheels, Proper Adjustments for OSHA and ANSI Compliance Rockton, Illinois, July 18, 2007: Danray Products LLC has introduced its one-of-a-kind, copyrighted safety sign for bench grinders. 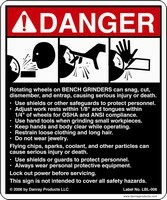 This danger sign addresses the main safety hazards created by rotating wheels on bench grinders. It also informs operators and employers of the proper work-rest and tongue adjustments for compliance with OSHA 29 CFR 1910.215, ANSI B11.9, and ANSI B7.1. This sign is 5" L x 6" H. Danray Products' safety sign has been designed to comply with the latest ANSI Z535 standards for the design, application, and use of signs, colors, and symbols for accident prevention. This 0.002"-thick polyester sign has a high-bond-strength acrylic adhesive by 3M that has excellent chemical resistance and holding strength even at high temperatures (up to 350°F). This adhesive is the best choice for labels that need to adhere to LSE (low surface energy) plastics, powder coatings, or oily metals.